We are offering multicolor lanyards. In the manufacturing and trading domain, we are offering multicolor lanyards that are elegant in appearance. We ensure our ranges are manufactured to be high standards and quality. These products are provided with strong attachable clips and soft neck rest. 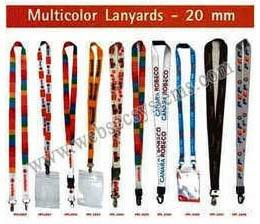 Moreover all our lanyards are of various designs and shades to present a royal look. These products are provided with facility of writing names over it as per client’s request.